Nourishing chicken soup has unique healing properties. It is ideal for recuperation of sick people in the healing process and perfectly improves the condition of the body weakened from colds. To cook really healthy and delicious soup of chicken, you should know some little tricks. In the composition of the broth contains cysteine - an amino acid that causes the liquefaction of sputum, and effectively contributing to the improvement of the human condition, suffering from diseases of the bronchi and lungs. The broth also contains iron and magnesium, copper and calcium, selenium and vitamin B. They help improve the functioning of the Central nervous system and normalize metabolism, thereby increasing the resistance of the human organism to adverse factors. 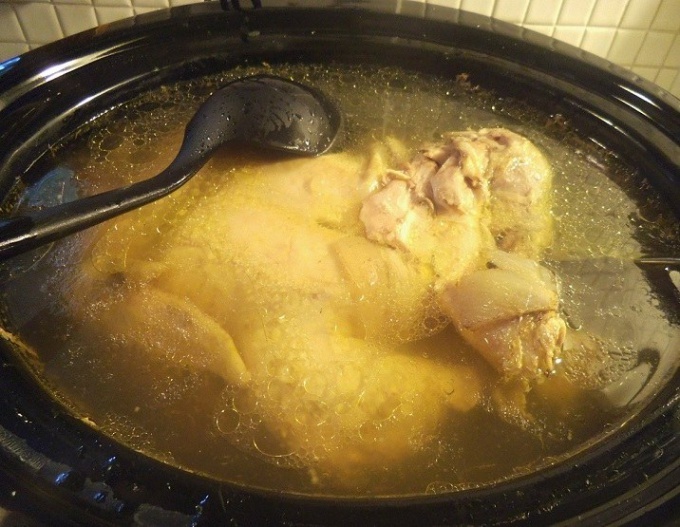 The easiest way to prepare the broth from a whole chicken, and it was more nourishing, fragrant and delicious, it is best to shifted the bird into several pieces. Usually it is cut into four parts. Prepared and thoroughly washed under running water the meat is put into a clean pot and filled with cold water so that it for a couple of inches covered the chicken pieces on top. Once the water in the pot is boiling, reduce the flame and gently remove with a spoon the entire formed on the surface of the water foam. Doing this is easiest with a slotted spoon. The foam should be promptly and completely removed throughout the cooking time, or the soup will lose its transparency. After the foam will become very small, into the pot, you have to put a large peeled onion, parsley root and chopped large carrot slices. After twenty minutes of cooking the vegetables in the broth will be to put spices to taste. You can use allspice or black peppercorns, rosemary or Bay leaf, saffron or cloves. It is important to make sure they were not too much, otherwise the seasoning will just kill the taste and unique flavor of chicken broth. Once you add to the pot with all the necessary vegetables and spices, you will just have to salt the water and cook the dish to simmer for another forty minutes. 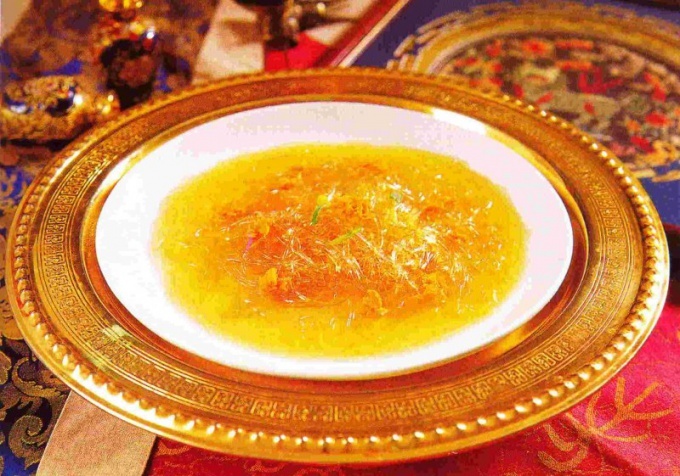 Ready chicken soup is clear and rich, and on its surface float beautiful slices of chicken fat, with a nice amber-yellow color. Serve the broth in a separate dish, or use as the base for other dishes. When applying in each plate put a piece of boiled chicken meat, half-boiled eggs, finely chopped parsley or dill. Also on the table you can put sour cream, which perfectly complement the taste is fragrant and rich broth. 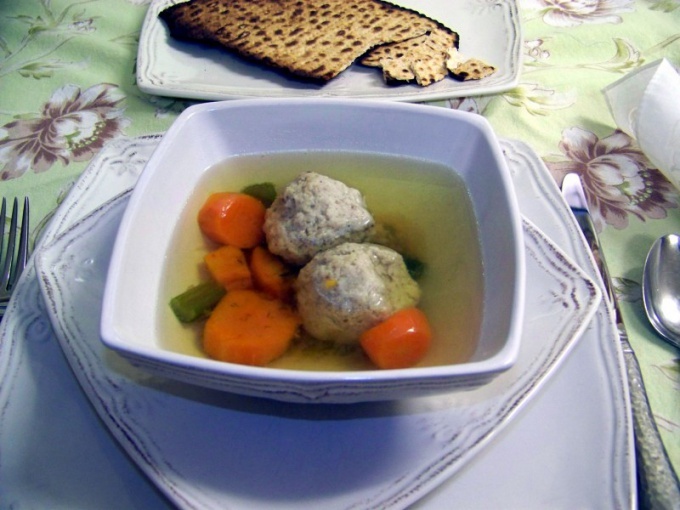 Chicken broth – a delicious, nutritious dish that is loved and appreciated in every family. It is not only delicious, but also very useful for healing and strengthening the immune system during colds. Because chicken meat contains large amounts of protein, polyunsaturated fatty acids, and vitamins of group B.
Pour into a saucepan of cold filtered water. Please note that the pan needs to be big enough to fit a whole chicken. Typically fits a 3-liter pot. Rinse thoroughly gutted chicken under running water. Place washed chicken in a pot of water. Put the saucepan on a high heat and bring the water to a boil. Drain the first broth, and dial in a pot of cold filtered water again. Return the broth to a boil. Now carefully remove the formed foam, and reduce heat to a minimum. Be prepared for the fact that in the process of cooking you will need to remove the foam more than once, as it becomes available. Put in the broth carrots. Moreover, the carrots cut lengthwise into two halves. It is cooked in a brothof 15 minutes, absorbing everything "bad" that may be contained in the chicken. Then, remove the slices of carrots and discard. Add to the pan cleaned from the husk onion, salt to taste and peppercorn..
Simmer the broth over low heat for 2 hours. Always check chicken with a fork. If the fork easily pierces the meat of chicken drumsticks, so the chicken is already cooked. Remove the chicken from the broth. In the future, you can prepare from it a dish in its sole discretion. Ready broth be sure to strain through a sieve and then pour in a beautiful tureen. On your own you can add to the soup chopped dill or freshly made croutons. Do not use for cooking broth, the water from the tap. This can adversely affect the taste and quality of the broth. Use only filtered water. Secondary broth cook over low heat. Under this condition, the broth isn't boiling, and stewing under the lid. And then Your soup will be clear and very beautiful. 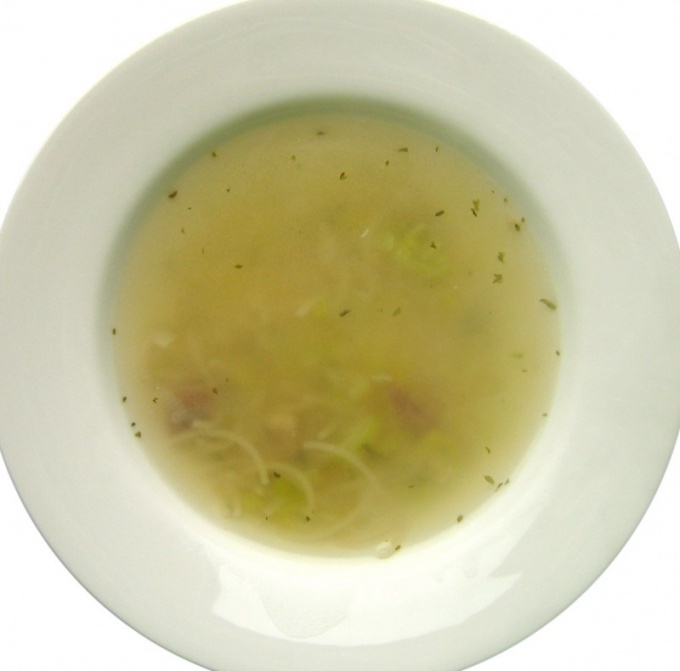 On the basis of meat broth soups are boiled to make Brawn, he can be an independent dish such as egg or greens. In any case, you want the broth transparent, because muddy is able to repel the appetite of even the very unpretentious person, not to mention the gourmet. To ensure that your culinary masterpiece to be transparent, necessary in the process of making it. The perfect broth is obtained, if it is clear in several stages. Cook it on slow fire, periodically removing the foam. There is a slotted spoon — a large spoon with holes. When the broth will already be almost ready, remove from pan and large pieces of meat. A slow fire is needed to boil the broth was not particularly rapid. If boiling is not very strong, the broth right is more or less transparent. Fold the gauze in 3-4 layers and strain the broth. At this stage, removed the foam, small pieces of meat, bones, etc. In principle, it is possible and strain through a very fine sieve. Pour the broth back into the pot. For the clarified soup so the broth is fine, but if you prepare it as a separate dish or the basis for a jelly, will have some work to do. Separate the protein from the yolk. This is done in the following way. Knock on the egg shell with a spoon or knife so that the middle started cracking. Substitute a small bowl or Cup. Over it cracked the shell to make 2 "cups". Several times pour the yolk from one to the other. Protein should drip into the bowl. Yolk use at its discretion, for clarification of the broth you won't need it. Protein from one egg will be enough to lighten 2l of broth. Whisk the whites. Use for this a mixer or a whisk. Egg protein is an excellent sorbent. It is possible to make its action more effective by adding 1 ice cube 1 protein. If you mix 1 egg white with 100g of ground beef and a few tablespoons of broth, and then everything is slightly beat, the absorbent not only lighten the broth, but will add nutrients. While you were preparing the absorbent, the broth you might have time to cool down. Heat it through but do not boil. Carefully pour the absorbent. Stir in broth, to dissolve a protein or another absorbent over the entire pan. The stream should be thin and uniform. Do not stop to stir the contents of the pot after protein will disperse. Make a slow fire and bring the broth to a boil. Give the contents of the pan to writing a rolling boil for five minutes. Cool the broth at room temperature. Especially with a slotted spoon to catch the pieces of coagulated protein is not necessary, he himself will sink to the bottom. Strain the broth through cheesecloth. A couple of layers for the second straining will be enough. Excellent absorbents are also rice and carrots. Boiled rice need to be put into a linen bag. Lower the bag for a few minutes in boiling broth. Carrots cut in half lengthwise, each half cut on two sides, and then dried in the pan. Fat in this case not needed. Place the prepared carrots in the broth for a few minutes before the end of cooking. Entrees are a necessary part of the menu. They improve digestion, provide the body with minerals. But to cook a delicious soup, the first thing you need to cook a proper soup — strong, transparent and fragrant. Select for cooking the meat first or second grade, shank, shank, shank. Thoroughly wash the meat under running cool water. Bones cut in several places. Fold the meat in a pan and cover with cold water. Cover the pan and quickly bring to a boil over high heat. Then reduce fire and cook broth at a very gentle boil. Remove with a slotted spoon the resulting foam. Vegetables peel and wash. Through 1-1,5 hours after boiling the broth to taste. Add the carrot, onion, celery and Bay leaf. When the meat is ready, place it into another bowl. Get vareniya fruits, herbs and Bay leaf and sieve the broth through a sieve. Wash eviscerated chicken in cold water. To prepare the broth will fit a bird weighing 1.5 kg. Cut the carcass into 4 pieces and add to the pan. Pour enough cold water to completely cover the bird for 3-4 cm, Put on fire and bring to a boil. Add in chicken broth, onions and carrots. Cook until the chicken is cooked 1 to 2 hours depending on the age, size, nutrition of poultry. Shortly before the end of cooking, salt the broth to taste. Collect the for making fish stock of small fish, such as Zander and perch. Clean it from scales, remove the innards, gills and rinse thoroughly. Cut the fish into portion pieces, add to a saucepan and cover with cold water. Or prepare a fish broth with sliced fillet of red fish. Cut onion slices. Parsley root peel and wash. Add the fish, salt, root vegetables and onions. Boil fish stock over low heat for half an hour. Then remove the fish pieces. If you cook the broth from small fish, then continue to cook the tail and head another 15-20 minutes. Ready broth drain. 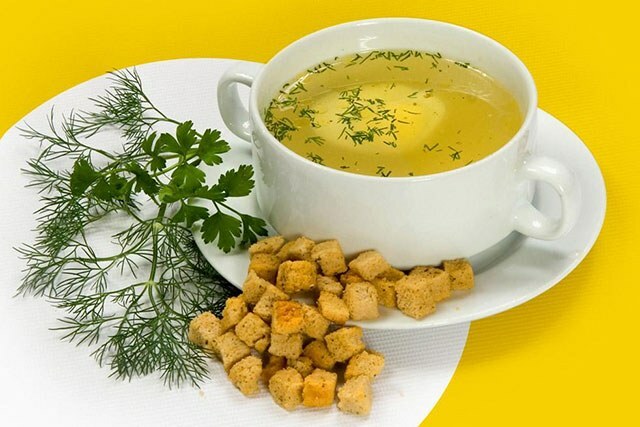 The chicken broth itself is not only tasty, but also useful for the first course, it is recommended to give the people recovering after a serious illness. In addition, it is the basis of a variety of soups, giving them a seductive taste and aroma. It is therefore important not to completely spoil the broth, cook it opaque and made the dish less appetizing. If the chicken carcass is frozen, it should first be thawed, put in the evening on the bottom shelf of the refrigerator or leaving in the morning for 2-3 hours at room temperature. Chilled or thawed chicken wash well in a bowl with cold water, especially carefully it is necessary to wash the inner part. If the pot in which you will cook the broth, large enough that the chicken can not be cut, otherwise cut the carcass into halves or quarters and rinse again to remove small bone fragments. Fold the chicken pieces or whole carcass in a pot and fill it with cold water to cover the bird on 1-2 fingers. Put the saucepan on the stove and turn it under maximum fire. Peel a small onion and a carrot. Onion cut is not necessary, carrots can be cut crosswise into 2-3 parts. Watch carefully over the stove, you should not miss the moment when the water in the pot starts to boil. Once you see that it will happen soon enough, armed with just a spoon or spoon with holes, take the saucer and start to remove the resulting foam. If you have time, fire can be slightly lower. In chicken broth, no spices, except the Bay leaf, add is not recommended, since the taste it good enough. By the time when the broth is going to greatly boil, foam, already all needs to be removed. The main secret of cooking, clear broth is not give the liquid to a full boil during the entire cooking process. So turn down the heat to minimum, stopping the process of churning, put in a pan onions and carrots. Salt the broth, but not to norms, not to overdo, because in the process of cooking, it is boiled slightly under cover. Make sure that the boil was not, but it was obvious that the broth is cooked. Cover pot and leave on the stove. To make the chicken broth a little hearty, add just before serving, dry homemade noodles or vermicelli. Simmered chicken, intended for cooking broth, and grown on the farm, cooked for 1 hour. Homemade chicken could be cooked longer, determine her willingness according to the degree of softness of the meat, it should begin to fall off the bones. Put in a saucepan a few leaves Lavrushka, keep the broth on the stove for another 10 minutes, then remove. Your delicious, nourishing, beautiful and clear broth is ready.